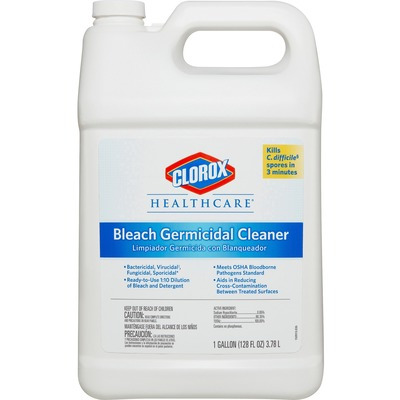 Healthcare Professionals Trust Clorox Healthcare Bleach Germicidal Cleaner To Help Them Overcome Infection Control Challenges In A Constantly Changing Healthcare Environment. 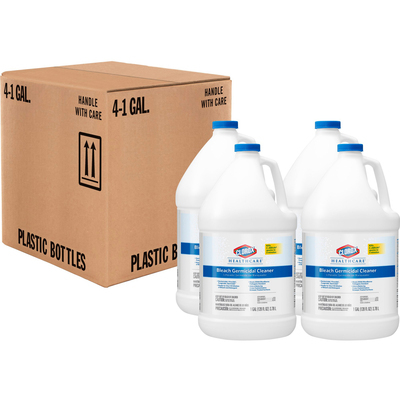 Ready-To-Use, One-Step Cleaner Contains A 1:10 Bleach Dilution To Meet Cdc And Osha Guidelines For Disinfecting Surfaces In Healthcare Settings. This Cleaner Is Epa-Registered To Kill A Total Of 58 Microorganisms, Including Hai-Causing Bacteria Like Mrsa And Vre In 30 Seconds, Outbreak-Causing Viruses Such As Influenza A And B Viruses, Measles Virus And Norovirus In 1 Minute And C. Difficile Spores, Tb And Fungi In 3 Minutes. This Disinfectant Kills 99.9999 Percent Of C. Difficile Spores, According To The Current Epa-Recommended Testing Standard (Nov. 2016). Intended For Use In Healthcare Settings, This Bleach Solution Features An Anticorrosion Agent And Is Formulated For Broad Surface Compatibility With Healthcare Surfaces Including Stainless Steel, Glass, Plastic, Glazed Ceramic, Laminated Surfaces And More..